Quick overview A text of pathophysiology that emphasizes 'concepts' of altered health states, as opposed to factual descriptions of diseases and disorders. It ensures a comprehension of the whole of body function and both the physical and psychological aspects of altered health. 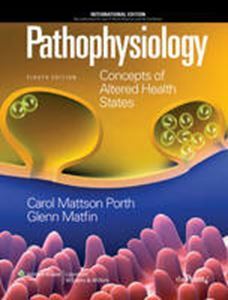 This is the Eighth Edition of the comprehensive and well-respected text and reference of pathophysiology. As a nurse-physiologist, Carol Porth uniquely emphasizes 'concepts' of altered health states, as opposed to factual descriptions of diseases and disorders. By taking this physiologic approach, the author ensures a comprehension of the whole of body function and both the physical and psychological aspects of altered health. This edition has a completely revamped art program and new displays that showcase pathophysiological processes though detailed visual representation. Other highlights include a greater international focus, expanded content on evidence-based practice and completely revised, updated chapters on genetics, disorders of white blood cells and lymphoid tissues, and innate and acquired immunity.